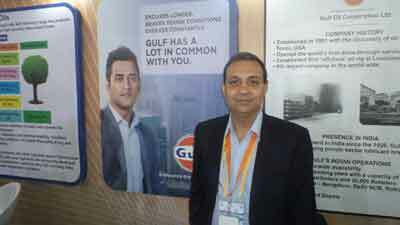 Gulf Oil has been one of the dominant players in the Indian Lubricants market. Strategically positioning itself against international bigwigs on the one hand, and domestic majors on the other, the company has managed to carve a niche for itself in a highly competitive market. Deepak K Tiwari, Senior General Manager – Infrastructure, Mining and Fleet Business, Gulf Oil Lubricants India Ltd., speaks to Shashidhar V about the necessity to adapt to changing trends and technologies in their journey to be the premier player in the country. In one of our previous meetings, you stated that Gulf Oil was keen to emerge as a top three player in the lubricant market in the country. How have you fared over the past year? See, we have scaled up our operations. Amongst all our competitors, I can safely say that we have almost reached the No. 1 slot, though we are not yet there, with internally also contributing 15 per cent to our business turnover. We have built a network of around 500 to 600 clients across the sectors. So, in roads, we are almost around 80 per cent. In aviation, we are close to 100 per cent. On Metro Rails, we are dealing with close to 100 per cent. So, for us, it has been a good growth phase, coming at a time when many of our competitors were talking about the stress in the economy. For us, it has been new sectors and we have managed to create our own space. Gulf Oil has been one of the fastest growing companies. We have always grown three times faster than the industry, and across sectors – industry, infrastructure, and retail. And, in the process, we have managed to make our unique mark across all these sectors. Today, we are on the verge of being the second largest player in the lubricants business. There isn’t much of a difference between No 2 and No 3, though. Gulf and Valvoline put together would be doing the similar kind of volumes of about 90,000kl. And, as the industry is now opening up, we have an aggressive plan on how to go ahead. We are coming up with a second capacity in Chennai. I would say that it is the first green plant in the country, which runs on its own power. It is fully automated in the sense that we are talking of application modules where we are going to simulate the actual condition of the product which we would be using in the equipment. So, unlike earlier product introductions, we will first simulate the product, and customise it to a customer’s needs. So, that is the kind of technology which we now have, with another capacity of 40,000kl. So, Nett, that should bring us close to 150,000kl. And, we are growing our business further two to three fold in the next 2-3 years time. What has been the investment in the Chennai plant? We have spent over Rs100-cr. How strategic is the Chennai plant for Gulf’s growth? Very strategic, since we already have Ashok Leyland, and we are looking at other OEMs. Chennai, because of its strategic location to the automotive sector, brings down my cost of operations and logistics. Plus, we are very close to our customers. Besides Ports, and infrastructure, what are the other strategic industry segments that you are looking at? Earlier, we were a single team operation. But, now, we have segmented our operations into sectors. So, Roads, Aviation and Irrigation would form one sector of operation for us internally. Mining is a separate sector altogether which we structured in November last year. And, now that the mining sector too has opened up, we are poised to grow similarly. Which are your high growth segments? I wouldn’t be able to give you the numbers to say which segments will be profitable for us, but if you were to look at it in terms of opportunity, the whole market is moving towards the b2b space over the b2c (space). If one were to look at the infrastructure projects that are in the process of implementation, those in the pipeline, and also the ones that would be built in the future, and the metro rail plans of various states – from 27 odd cities to close to 50 cities, some 150 new aviation centres have been planned, we are sure that the b2b market segment is our high growth area. For us, the after-market and the direct route of reaching out to our end customers, the whole pie will grow in the days ahead. And, in the era of electric vehicles, I think all lubricant players are now looking keenly at this space. I was coming to that. How are you leveraging the opportunities that would arise in the EV market? In areas like 2-wheelers or passenger cars, which we call personal mobility sector, they will be the first ones to be impacted by the EV technology. And, of course, the bus segment too will see a change with the introduction of EVs. So, with that, we are restructuring internally to look at the b2b segment to build the product portfolio which will suit infrastructure requirement. And, also, we are looking at the scenario post-EV era – what is it that we can – and need to – do to retain our position in the personal mobility sector. Quite a few lubricant manufacturers are looking at the renewable energy sector. What are the initiatives that Gulf Oil has taken on this front? As a group company, we too have invested in renewable energy through another vertical. At Gulf Oil, though, we are focussed on the pure lube play because that has been our core and we want to consolidate in that area. So, if you ask me what our focus areas are, we have the segmented market, we have the capacity, the technology, a dedicated team, and getting technology as an interface, because we believe that the country is going to be highly digitized in the next decade. So, to optimise the consumer happiness, we are doing a lot around technology internally so that we can have an interaction not just on social media but also from application to serve our consumers better. How would you use the data that is generated to serve your customers better, and provide better lubricants? We have an internal data analytics centre. But, we are still exploring multiple ways to see how we can collaborate with the consumer. As of now, all external consumer data is collated internally and interpreted on the internal integrated system. We run on SAP. Now, if our client too runs on SAP, then we can have a common platform of communication. Then, we can cut short the time and costs involved and communicate better. We are still exploring these areas. But, we will certainly get on the technology bandwagon. To what extent have your collaborations with OEMs seen a growth? We have seen a good growth. We are already with Ashok Leyland. We have also tied-up with Bajaj and Mahindra in the automotive sectors. For infrastructure sector, we are present with Bharat Benz, and Schwing Stetter for their factory fuel and also for their co-branding. And, also Kobelco, with who we have tied-up for their after-market growth warranty, across the products, from engine oil to gear oil, greases to hydraulics oil, which will be sold through their dealers. This is a good growth area for us because, today, we have a network and the clientele are largely common. So, we are aggressively exploring the space in which we can be present with the OEMs, be it genuine oils, or co-branding, etc. Most OEMs collaborate with various auto parts manufacturers. How do you collaborate with those companies, or your OEMs, and ensure that your oils are suitable and maintained properly? Currently, there are two models that are effective. One, the principal, where the recommendation comes from the principal. There are also companies that are a bit more friendly, because the sector in which we operate, lubrication is a task for all of them. Let me give you an example. Let us say that my client is based in Mumbai, and they bag a project in a remote area in the North East of the country. And, the client has five different equipments, purchased from different OEMs, managing five different brands of lubrication recommended by those OEMs, with skilled or unskilled workforce. It is a nightmare. So, there have been clients who have been rather friendly and they have come to realise that it is practically not possible from their clientele side to handle such a requirement. So, that is an area that is available to us. Many OEMs have approached us to see if we can collaborate with them. Our global technology team is located right here in India. So, we believe that we have an upper hand over our competitors to cater to the needs of these OEMs, customised to Indian operations. Similarly, for European or US-based manufacturers, we have a technology team that is located in London. So, we have a dual approach – one is local, to cater to local needs, and the other that is global-centric. And, accordingly, with the space available, we are progressing further. So, coming back to your question, internally, we have two teams. One, of course, the OEM team. They get involved when the technology is being worked out. For example, Ashok Leyland. We are present right from the time of the development of any new technology. And, there, we have used the long drain oil as our USP. We are the first to move the usage from 20,000 kms to 40,000 kms, and then to 80,000 kms. At the same time, there is also a route available where we may not get the space to align at the time of the development of the technology. In such a situation, we try to explore the after-market route. Synthetic oils are making their way into the country for some time now. Where does Gulf Oil stand on this front? We largely use Group III, which is the highest version of mineral oil. So, close to 70 per cent of my portfolio is on this mineral oil, which is very close to synthetic. You were speaking about long-drain intervals. Coupled with a lack of market awareness, it could also slow down your market penetration or impact your overall market pie. How are you addressing this aspect? That is a very interesting point. At the one end, technology is evolving, while at the other end, it is communication. So, we have built it around the brand and, in the last decade, systematically, we as a company, have been educating our end-users, across sectors, be it automotive, industrial or infrastructure. We are building a consumer connect by leveraging on the brand association with well-known personalities, like Mahendra Singh Dhoni talking about our lubes, for instance. So, there is a consumer connect. We are using social media extensively to connect with our consumers to create awareness. Lastly, what would you say will be the disruptions in your industry, going ahead? India has always been a competitive market. But, we believe that if a company has a defined strategy, disruptions will not impact it much. Our association with our consumers has seen us grow three fold in the past as many years. And, that is primarily because of our initiatives to connect with our end-users. I think you need to check with my competitors if we could be a disruptor for their growth.